Specialized sensors can also be equipped within living spaces to monitor the health and general well-being of senior citizens, while also ensuring that proper treatment is being administered and assisting people regain lost mobility via therapy as well. These sensors create a network of intelligent sensors that are able to collect, process, transfer and analyse valuable information in different environments, such as connecting in-home monitoring devices to hospital-based systems. Other consumer devices to encourage healthy living, such as connected scales or wearable heart monitors, are also a possibility with the IoT. End-to-end health monitoring IoT platforms are also available for antenatal and chronic patients, helping one manage health vitals and recurring medication requirements. As of 2018[update] IoMT was not only being applied in the clinical laboratory industry, but also in the healthcare and health insurance industries. IoMT in the healthcare industry is now permitting doctors, patients and others involved (i.e. guardians of patients, nurses, families, etc.) to be part of a system, where patient records are saved in a database, allowing doctors and the rest of the medical staff to have access to the patient's information. Moreover, IoT-based systems are patient-centered, which involves being flexible to the patient's medical conditions. IoMT in the insurance industry provides access to better and new types of dynamic information. This includes sensor-based solutions such as biosensors, wearables, connected health devices and mobile apps to track customer behaviour. This can lead to more accurate underwriting and new pricing models. The IoT can assist in the integration of communications, control, and information processing across various transportation systems. Application of the IoT extends to all aspects of transportation systems (i.e. the vehicle, the infrastructure, and the driver or user). Dynamic interaction between these components of a transport system enables inter and intra vehicular communication, smart traffic control, smart parking, electronic toll collection systems, logistic and fleet management, vehicle control, safety and road assistance. In Logistics and Fleet Management for example, an IoT platform can continuously monitor the location and conditions of cargo and assets via wireless sensors and send specific alerts when management exceptions occur (delays, damages, thefts, etc.). This can only be possible with the IoT and its seamless connectivity among devices. Sensors such as GPS, Humidity, Temperature, send data to the IoT platform and then the data is analyzed and send further to the users. This way, users can track the real-time status of vehicles and can make appropriate decisions. If combined with Machine Learning then it also helps in reducing traffic accidents by introducing drowsiness alerts to drivers and providing self-driven cars too. The Internet of things would encode 50 to 100 trillion objects, and be able to follow the movement of those objects. Human beings in surveyed urban environments are each surrounded by 1000 to 5000 trackable objects. In 2015 there were already 83 million smart devices in people's homes. This number is about to grow up to 193 million devices in 2020 and will for sure go on growing in the near future. ^ Inc., Apple. "HomeKit – Apple Developer". developer.apple.com. Retrieved 2018-09-19. ^ Wollerton, Megan (2018-06-03). "Here's everything you need to know about Apple HomeKit". CNET. Retrieved 2018-09-19. ^ a b Lovejoy, Ben (2018-08-31). "HomeKit devices getting more affordable as Lenovo announces Smart Home Essentials line". 9to5Mac. Retrieved 2018-09-19. ^ Prospero, Mike (2018-09-12). 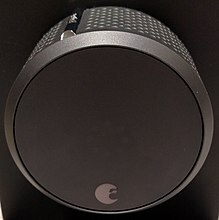 "Best Smart Home Hubs of 2018". Tom's Guide. Retrieved 2018-09-19. ^ a b Kricka, LJ (21 June 2018). "History of disruptions in laboratory medicine: what have we learned from predictions?". Clinical Chemistry and Laboratory Medicine. doi:10.1515/cclm-2018-0518 (inactive 2018-11-27). PMID 29927745. ^ Grell, Max; Dincer, Can; Le, Thao; Lauri, Alberto; Nunez Bajo, Estefania; Kasimatis, Michael; Barandun, Giandrin; Maier, Stefan A.; Cass, Anthony E. G. (2018-11-09). "Autocatalytic Metallization of Fabrics Using Si Ink, for Biosensors, Batteries and Energy Harvesting". Advanced Functional Materials: 1804798. doi:10.1002/adfm.201804798. ISSN 1616-301X. ^ Dincer, Can; Bruch, Richard; Kling, André; Dittrich, Petra S.; Urban, Gerald A. (2017-08-01). "Multiplexed Point-of-Care Testing – xPOCT". Trends in Biotechnology. 35 (8): 728–742. doi:10.1016/j.tibtech.2017.03.013. ISSN 0167-7799. ^ "Key Applications of the Smart IoT to Transform Transportation". 2016-09-20. Retrieved 28 October 2017. ^ a b c d Haase, J.; Alahmad, M.; Nishi, H.; Ploennigs, J.; Tsang, K. F. (1 July 2016). "The IOT mediated built environment: A brief survey". 2016 IEEE 14th International Conference on Industrial Informatics (INDIN): 1065–1068. doi:10.1109/INDIAN.2016.7819322 (inactive 2018-11-27). ^ "THE INTERNET OF THINGS (IOT): REVOLUTIONIZED THE WAY WE LIVE!". Postscapes. 2017-08-10. Retrieved 23 October 2017. ^ "Western Singapore becomes test-bed for smart city solutions". Coconuts Singapore. 2014-06-19. Retrieved 11 July 2014. ^ Fitchard, Kevin (2014-05-20). "Sigfox brings its internet of things network to San Francisco". Gigaom. Retrieved 15 May 2015. ^ a b Scuotto, Veronica; Ferraris, Alberto; Bresciani, Stefano (2016-04-04). "Internet of Things". Business Process Management Journal. 22 (2): 357–367. doi:10.1108/bpmj-05-2015-0074. ISSN 1463-7154. ^ a b c d Traukina, Alena; Thomas, Jayant; Tyagi, Prashant; Reddipalli, Kishore (2018-09-29). Industrial Internet Application Development: Simplify IIoT development using the elasticity of Public Cloud and Native Cloud Services (1st ed.). Packt Publishing. p. 18. ^ Pal, Arpan (May–June 2015). "Internet of Things: Making the Hype a Reality" (PDF). IT Pro. Retrieved 10 April 2016. ^ van der Zee, E.; Scholten, H. (2014). "Spatial Dimensions of Big Data: Application of Geographical Concepts and Spatial Technology to the Internet of Things". In Bessis, N.; Dobre, C. Big Data and Internet of Things: A Roadmap for Smart Environments. Springer. pp. 137–68. ISBN 9783319050294. ^ "Can we talk? Internet of Things vendors face a communications 'mess'". Computerworld. 2014-04-18. Retrieved 5 June 2016. ^ Jing, J.; Li, H. (2012). "Research on the Relevant Standards of Internet of Things". In Wang, Y.; Zhang, X. Internet of Things: International Workshop, IOT 2012. Springer. pp. 627–32. ISBN 9783642324277. ^ Rasit, Yuce, Mehmet; Claus, Beisswenger, Stefan; Mangalam, Srikanth; Das, Prasanna, Lal; Martin, Lukac (2017-11-02). "Internet of things : the new government to business platform – a review of opportunities, practices, and challenges": 1–112. ^ Franceschi-Bicchierai, Lorenzo (2015-07-29). "Goodbye, Android". Motherboard. Vice. Retrieved 2 August 2015. ^ Acharjya, D.P. ; Ahmed, N.S.S. (2017). "Recognizing Attacks in Wireless Sensor Network in View of Internet of Things". In Acharjya, D.P. ; Geetha, M.K. Internet of Things: Novel Advances and Envisioned Applications. Springer. pp. 149–50. ISBN 9783319534725. ^ Li, S. (2017). "Chapter 1: Introduction: Securing the Internet of Things". In Li, S.; Xu, L.D. Securing the Internet of Things. Syngress. p. 4. ISBN 9780128045053. ^ Maras, M.-H. (2015-04-07). "Internet of Things: security and privacy implications". International Data Privacy Law. 5 (2): 99–104. doi:10.1093/idpl/ipv004. ISSN 2044-3994. ^ Liu, Ximeng; Yang, Yang; Choo, Kim-Kwang Raymond; Wang, Huaqun (2018-09-24). "Security and Privacy Challenges for Internet-of-Things and Fog Computing". Wireless Communications and Mobile Computing. 2018: 1–3. doi:10.1155/2018/9373961. ISSN 1530-8669. ^ a b c d e Antonakakis, Manos; April, Tim; Bailey, Michael; Bernhard, Matt; Bursztein, Elie; Cochran, Jaime; Durumeric, Zakir; Halderman, J. Alex; Invernizzi, Luca (August 18, 2017). Understanding the Mirai Botnet (PDF). Usenix. ISBN 978-1-931971-40-9. Retrieved May 13, 2018. ^ https://www.facebook.com/geoffreyfowler. 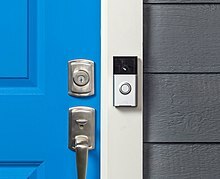 "The doorbells have eyes: The privacy battle brewing over home security cameras". Washington Post. Retrieved 2019-02-03. ^ Littman, Michael; Kortchmar, Samuel (2014-06-11). "The Path To A Programmable World". Footnote. Retrieved 14 June 2014. ^ Light, A.; Rowland, C. (2015). "Chapter 11: Responsible IoT Design". In Rowland, C.; Goodman, E.; Charlier, M.; et al. Designing Connected Products: UX for the Consumer Internet of Things. O'Reilly Media. pp. 457–64. ISBN 9781449372569. ^ a b c d "Taming the IoT terminology zoo: what does it all mean?". Information Age. Vitesse Media Plc. 2015-07-30. Retrieved 14 March 2017. ^ Basenese, Louis (2015-12-21). "The Best Play on the Internet of Things Trend". Wall Street Daily. Wall Street Daily. Retrieved 28 March 2017. ^ a b c d Anthony, Scott (2016-07-15). "Disruptive Innovation: Kodak's Downfall Wasn't About Technology". Harvard Business Review. Harvard Business Publishing. Retrieved 30 March 2017. ^ Solaimani, Sam; Keijzer-Broers, Wally; Bouwman, Harry (2015-05-01). "What we do – and don't – know about the Smart Home: An analysis of the Smart Home literature". Indoor and Built Environment. 24 (3): 370–383. doi:10.1177/1420326X13516350. ISSN 1420-326X.